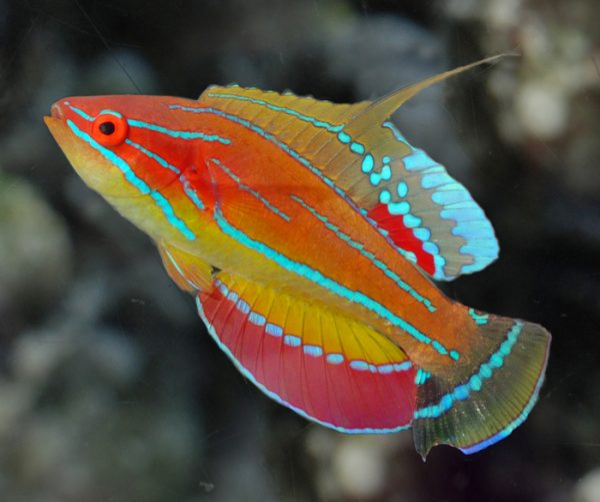 McCosker’s Flasher Wrasse gets the “flasher” part of its name from the electric neon blue colors it flashes during the male’s nuptial display for the females. This small, stunning fish certainly lives up to its name! Flasher wrasses are some of the most perfect and popular reef safe fish available. They are peaceful, won’t harm corals or invertebrates, and they spend most of their time in the water column swimming and interacting. They may be aggressive toward other flasher wrasses, so use caution when introducing new wrasses. They’re most interesting when housed in groups with multiple females per male; his energetic courtship displays will amaze you. They are not difficult to feed and will eat meaty foods like frozen mysis and enriched brine. They may eat pellets and other prepared foods as well.